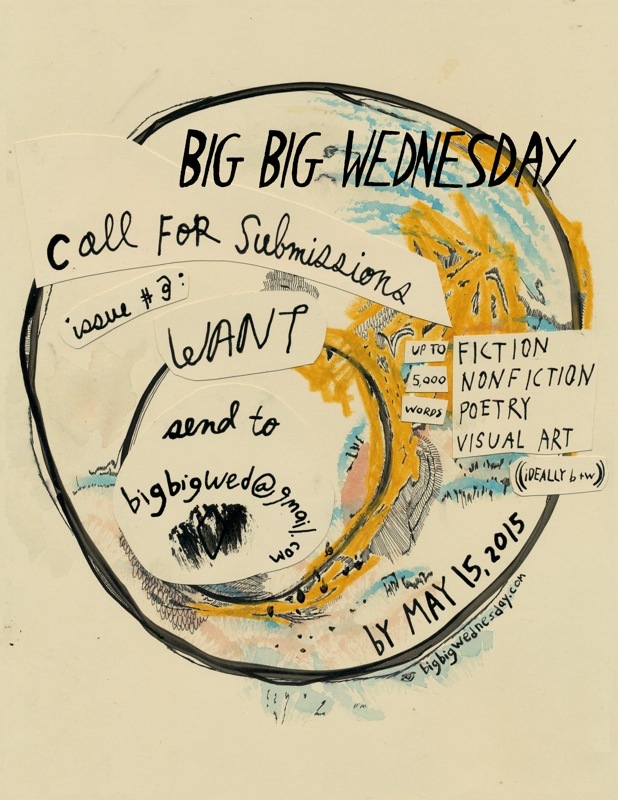 We’re so pleased to announce that Big Big Wednesday has been selected for a fellowship from Oregon Literary Arts. Thank you! It’s such an honor. Issue Two Release Party in NYC! We are so pleased to announce that we were recently awarded a grant from the Regional Arts & Culture Council in Portland, OR, to fund our next issue! We are honored that Big Big Wednesday was selected, and the grant will enable us to make some exciting improvements to our project. 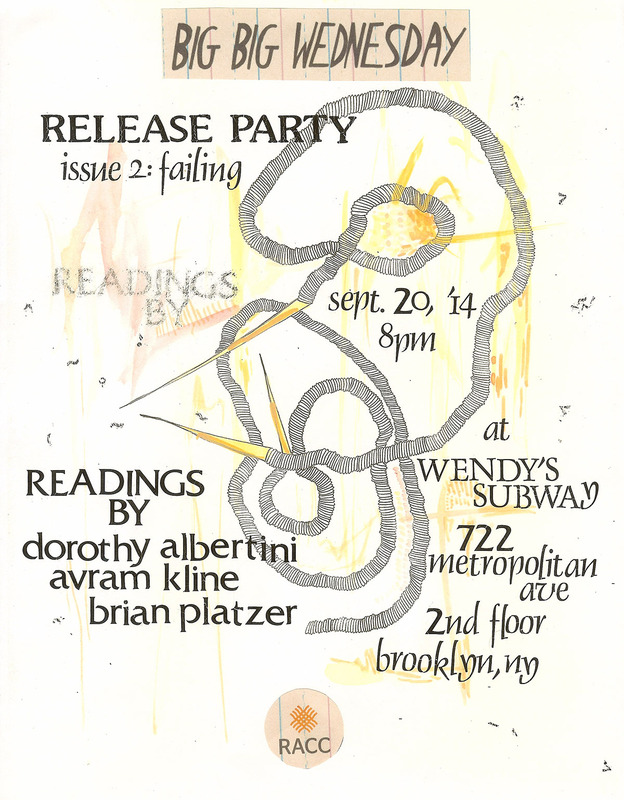 The theme for the issue is “Failing,” and we encourage you to interpret this as directly or indirectly as you wish. We hope you consider submitting your work! We’re looking for poetry, fiction, nonfiction and visual art. We’ll also be accepting submissions for four regular nonfiction features: Research (investigations into a topic of interest), Recipes (a favorite recipe accompanied by a relevant story or essay), Real Estate (explorations of where you live or lived – house, neighborhood, town, etc.) and Recommendations (something you’d recommend to others, and a short paragraph explaining why). As with the issue’s theme, we hope to see variety and inventiveness within these parameters. Written submissions should be under 5,000 words, and we prefer black and white visual art, but of course, as you can see in our first issue, we do make exceptions. All submissions can be sent to bigbigwed@gmail.com. Come visit us at the Portland Zine Symposium this Sunday 8/11/13 from 10-5! 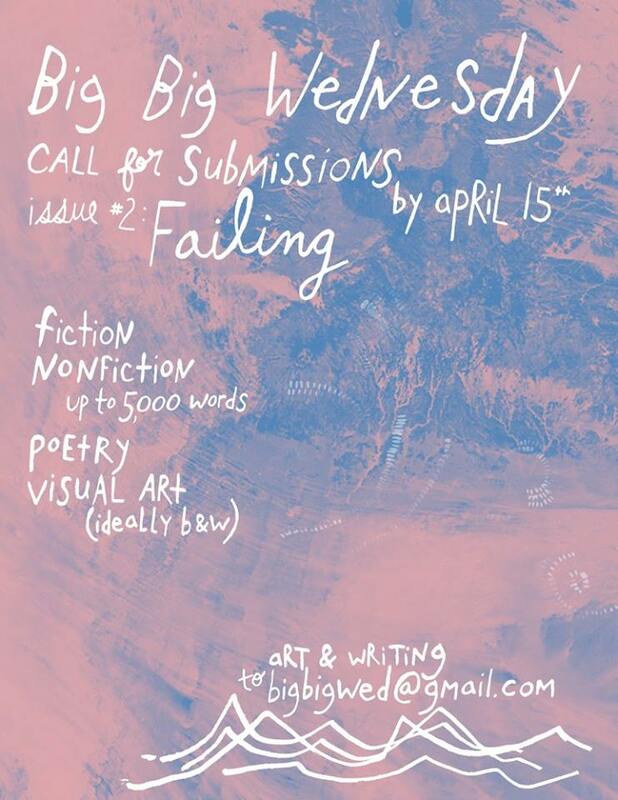 We’ll have a table and we’ll be selling the first issue of Big Big Wednesday. It will be a great event and we’re thrilled to be a part of it. Come say hello! Our release party was a big success! Thanks so much to everyone who came, and to our readers and Hazel-Ra. 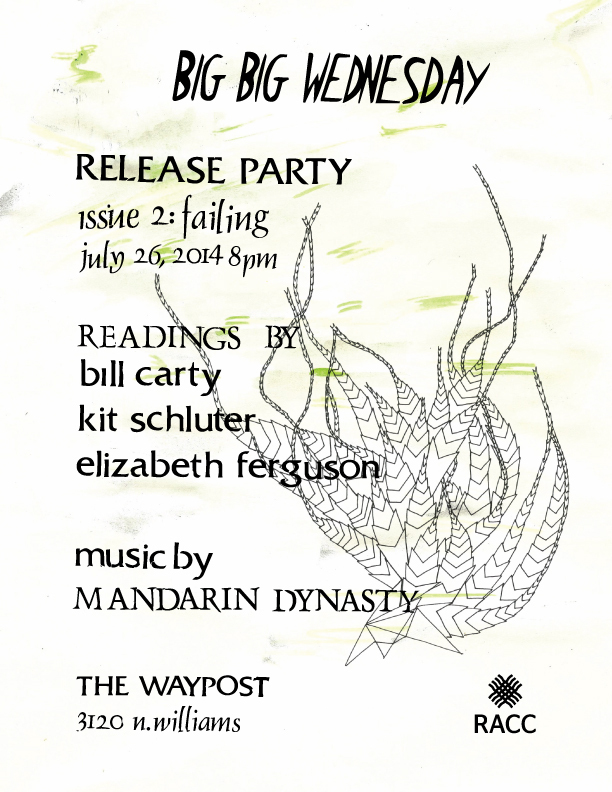 Check out Big Big Wednesday in the new Portland Mercury!